There’s a lot to be said for Beryllium. The lightest (stable) metal in the Periodic Table, only Hydrogen, Helium and Lithium are less heavy. That makes for an exceptionally strong structure for any given weight, just right for loudspeakers! It is far better suited to the job of moving air than anything made from heavy old Magnesium or Aluminium – the use of which could be likened to making racing cars out of steel. The reason everyone doesn’t use Beryllium is that it is expensive to fashion, and dangerous if not handled correctly in the manufacturing process. This explains why so few speakers have ever employed this material; the notable exception being Yamaha’s NS-1000M. This has its weaknesses, but the speed, clarity and insight is like no other I have heard. 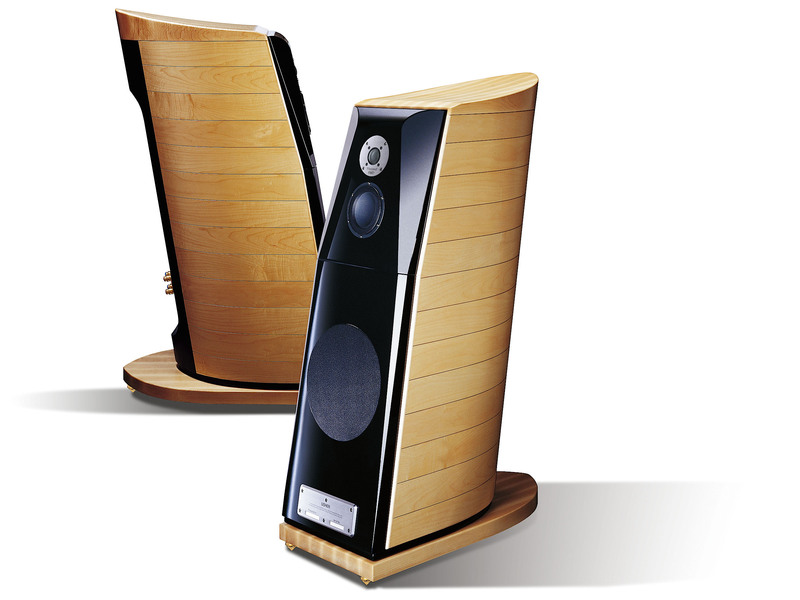 The Yamaha’s strength comes not from using a Beryllium tweeter, but from mating one to a five inch Beryllium midrange dome so deftly. With this speaker, you have all the most audible frequencies handled by phase-coherent, identical sounding transducers, and the results are startling. Well, to this select group you can now add the Usher BE-10, for it too runs a Beryllium tweeter and midrange unit, although Usher has chosen to invert the midrange dome to a cone profile. This, says the company, is the first ever such driver. £10,500 buys you a very big (365x715x1215mm) box weighing no less that 92kg (including its base). The BE-10 is, like so many of my favourite loudspeakers, a big three-way running a 1.25″ Beryllium tweeter from 40kHz down to 3.46kHz, after which that 5″ inverted Beryllium dome takes over. This goes down to 550Hz, when an 11″ woofer handles everything right down to 25Hz (claimed) with the help of bass reflex loading. One problem for the bass unit to contend with, with two of the world’s fastest, lightest drivers pulsing away above it, is how to keep up. For this reason, Usher has chosen Kevlar (patented para-aramid synthetic fibre) which is famous for being used in bulletproof jackets, amongst other things, due to it being five times stronger than steel on a weight-for-weight basis. The cabinet is a familiar profile for Usher, being rounded at the back (to reduce resonances) and angled backwards (to provide time-alignment). Needless to say it is massively braced and the standard of finish is flawless. This is one of the most impressive speakers I have heard. I’m a fan of big three ways, and few compare to this. Exceptionally clear from top to bottom, nevertheless it isn’t the usual sort of dry, sterile focus than so many so-called ‘reference’ loudspeakers serve up. Instead, this is natural and effortless. Rather than shining a thousand Watt bulb on the recording and clicking in the zoom lens, the Usher provides a wide angle window on what’s going on without preoccupying itself (or you) on individual detail points. It also brilliantly resolves every detail of the song, but doesn’t draw attention to itself in so doing. The big Usher doesn’t sound ‘impressive’ though; it’s not like it is trying hard to push out everything at you. It’s all there but surprisingly you can take it or leave it. The combination of detail and delicacy allied to tremendous ease is what defines this brilliant box, and it is largely down to the perfect integration between all three drive units. Just having a trick tweeter isn’t enough. It’s the seamless combination of HF and midband units with very similar phase characteristics and tonal character (however unobtrusive this may be) that makes for such an open, lucid and yet subtle sound. Although lesser Usher speakers have Beryllium tweeters, this can create more problems than it solves, because it’s impossible to harmoniously marry them to a midrange unit that’s not made of the same super-light material. The end result hasn’t been bad, but still at times seems almost less than the sum of the parts. Here though, it is precisely the opposite – the two top drivers give seamless clarity that puts most electrostatics to shame, then go on to marry up with that big Kevlar bass unit blissfully. Bass is strong, powerful, taut, firm yet never overbearing. This means the BE-10 goes very loud without showing strain, giving something very close to a ‘live PA’ sound at high levels. Indeed, my only gripe is that this speaker just lacks pin-sharp bass. Although there’s negligible box boom from the big cabinets, it’s obvious that these are reflex port-loaded loudspeakers, lacking as they do the instantaneous LED-like ‘on-off’ quality of infinite baffle designs. This subtle slurring at the bottom end (and it is subtle) is pretty much the only blot on an otherwise pristine copybook. So many high end speakers are obviously flawed. Glorious flaws they may be; indeed some people even buy them because of these ‘quirks’; but imperfections they remain. Yet the Usher BE-10 is almost perfect to my ears; it is exceptionally open and expansive, whilst being uncoloured to a degree than makes your average electrostatic sound like a pair of disco speakers. It works brilliantly with all sorts of music and always draws your attention to the innate goodness of the recording rather than its faults. Superb at capturing the essence of recording, it also gives you chapter and verse about the fine detail. Dizzyingly fast and dynamic, the Usher BE-10s make music magic. Can’t say fairer than that!